The Autogiro can be described as a wingless powered aircraft deriving lift and control through three normally unpowered rotor blades. A radial engine and propeller provided forward motion and altitude. The original rotor blades were constructed of a hollow high tensile steel spar with wooden ribs threaded on and fixed. The blades were sheathed with wood which was then covered with fabric. The fuselage is of welded steel tube faired to an oval section by eight wooden formers and stringers and fabric covered. The horizontal tail plane is of spruce spars, and the ribs are fabric covered. The engine is a 140 hp, 7 cylinder radial Armstrong Siddeley Genet Major 1A. Photographs of the aircraft in the period 1935 to 1939 show the Autogiro in its Avro-Cierva colour scheme of dark blue with a silver cheat line. During World War II it was in a total silver livery with either dark blue or black registration marks. After its donation to the Royal Aero Club of New South Wales, the club colours of orange and blue were applied in fuselage bands covering the registration marks, as these could no longer be displayed legally. The Autogiro was designed by the young Spanish aeronautical engineer, Don Juan de la Cierva who was born on 21 September, 1895, at Murica, Spain, the son of a leading politician. After an early interest in aviation, Cierva studied engineering in Madrid and designed and built a large three-engine biplane bomber. The crash of this plane in 1919 caused by loss of flying speed near the ground led Cierva to strive to make aviation a safer and more practical activity. He then began his development of a practical rotary wing aircraft that could land safely and not stall and his designs were said to have employed many principles expounded by Leonardo da Vinci. At first Cierva's Autogiro models were not successful but by the C6 version, Cierva had achieved a flyable aircraft. This aircraft was brought to Britain at the invitation of H. E. Wimperis, Director of Research at the Air Ministry and demonstrated at R.A.E. Farnborough. This was so successful that two similar Autogiros were ordered with Avro contracted to build them. At this time Cierva was his own test pilot undertaking most of the experimental and developmental flying. In 1926 Cierva established the Cierva Autogiro Co. Ltd in England and he formed a long association with the A.V. Roe company to design and construct Autogiros. Other companies licensed by Cierva's company to produce Autogiros were, Westland and De Havilland in Britain, Pitcairn and Kellett in the U.S.A., and Focke Wulf in Germany. The Autogiro reached a peak of achievement in 1933 when the C30 was first demonstrated at Hanworth. Unlike its predecessors this model was not fitted with wings. Control was achieved purely by tilting the rotor. Over one hundred C30A model Autogiros were built under licence by various companies and sold to civil operators in Europe, India, Australia, China and South America while a batch was bought by the Air Ministry. The Museum's Autogiro was built at Newton Heath, Manchester, England, in 1934, by A.V. Roe Ltd (Avro). Cierva's crowning achievement was the successful development of the direct take-off Autogiro, first demonstrated on Hounslow Heath in July 1936. An Autogiro was also used to film the 1936 Cup Final at Wembley using telephoto lenses. The Autogiro did not survive the untimely death of Cierva at the age of 41 on 9 December, 1936. Ironically the cause of his tragic demise was in the crash of a conventional airliner, a KLM DC-2, during take off, at Croydon Aerodrome, London. Although some development continued for a further five years in America and England with the 'direct take-off' C40 Autogiro, the driving force had been lost. The outbreak of the Second World War curtailed any further research in England but Cierva's work was embodied in the single-rotor Sikorsky helicopters, developed from 1940. Sadly no manufacturer's drawings or photographs survive of the C30A Avro Autogiros as they were destroyed in a fire at Avro's Chadderton factory in October 1958. The Museum's Autogiro was purchased new as a private aircraft by an Australian engineer, Mr Andrew Thyne Reid (known as Thyne Reid). Thyne Reid learnt to fly Autogiros at the Cierva Flying School at Hanworth in England in 1934. He was impressed with the safe, stall-proof characteristics of the Autogiro and the following year shipped his own Autogiro to Sydney on board SS "Anchises". The aircraft was used to transport Thyne Reid and his wife, Katharine, between Sydney and his family's country property 'Narrangullen', near Yass, NSW and other locations. His pilot's log refers to other destinations including Goulburn, Dunedoo, Rotherwood, Moree, Boolaroo, and Brisbane during 1936 and 1937. It was based at Mascot but was frequently flown from bushland behind the Reid's home at 'Madingley', Church Street (now Marsden Road), Carlingford, a Sydney suburb. Reid was the Managing Director of James Hardie & Co. of York and Barrack Sts, Sydney. On a personal level he was a keen aviator, owning a number of aeroplanes including a De Havilland Dragon and a De Havilland Drover as well as the Autogiro. He was also instrumental in the establishment of the Thredbo ski resort. The Autogiro was first registered in Australia, under Thyne Reid's, name on 14 June, 1935, renewed on 13 June, 1936, 13 June, 1937 and 13 June, 1939. During World War II Thyne Reid made the Autogiro available for military use. Although no records have so far been able to confirm it, the Autogiro was said to have been used by the Navy to check the tracking of torpedoes. A large camera port cut in the floor of the front cockpit seems to confirm this use. The Autogiro was chosen because it was the only aircraft slow enough above the ground. The torpedoes were made at Neutral Bay (Sydney) and the tests undertaken at Pittwater Range at Clareville. The pilot, Syd Marshall, had never flown an Autogiro before. The Autogiro was then impressed by the RAAF and assigned to the Army Inventions Directorate for another military project between about 1942-4 at Laverton Aerodrome, Melbourne, called "Project Skyward". This involved the development of a 'flying jeep' called a 'fleep' constructed from two other cannibalised Autogiros. The purpose of this aircraft was to provide transport for the army in Kokoda, New Guinea, as it was impossible to drive from Port Moresby to Kokoda and parachute-dropping the jeeps was considered too risky. 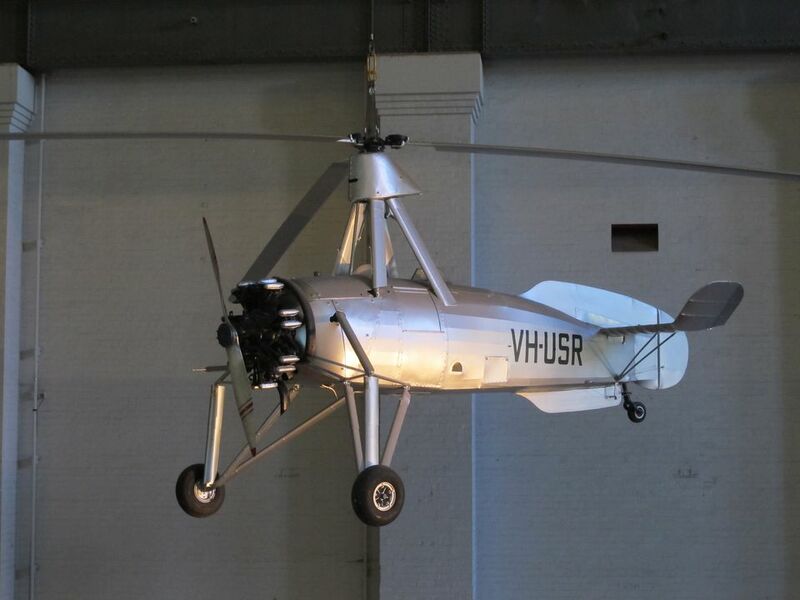 The Museum's Autogiro, VH-USR, was the only serviceable Autogiro of the four that had come to Australia and it was to be used to test its ability to be towed behind a Douglas Dakota aircraft. Because its towing speed would have been 120 knots, it was decided that the original rotor blades were not efficient enough at this speed and a new set of laminar flow blades constructed. The initial tow-tests were carried out behind a large Buick car to allow the pilot, Ken Frewin, to become accustomed to being towed without the problems of propeller backwash from the Dakota. The project was cancelled before the Autogiro was tested behind an aircraft. A piece cut out of the rotor-head shroud, to allow the attachment of the towing frame, is a reminder of these tests. The airframe incorporates a large rudder fitted to replace the small trim tab to allow greater control in cross winds. This rudder was fitted as a result of a capsize after the first towed run. At the point of touchdown a cross gust upset the aircraft and the pilot had no means of control against such problems. Repairs to the Autogiro in 1943 were undertaken by Marshall Airways, the engineer who worked on the motor was Rex Mitchell-Hill, the fabric covering was done by Lil Fletcher while the woodworker who repaired the broken rotor blades was Oscar Peter Vergison. The Autogiro was re-registered under Thyne Reid's name on 25 September 1948 and 23 September 1950. Apparently, it was last flown by Thyne Reid on 9 August, 1949. Thyne Reid's pilot's logbook records only 72 hours personal use of the aircraft. It was subsequently withdrawn from service on 28 June, 1950, and the registration was suspended and cancelled on 6 August, 1951. The Autogiro has never flown since. After Thyne Reid's death in the 1964, his widow donated the Autogiro to the Royal Aero Club at Bankstown Airport who used it as a static exhibit on air-fair days. In 1980 the Autogiro was purchased by the Powerhouse Museum with funds supplied by the Andrew Thyne Reid Charitable Trust which specified the Autogiro had to go on immediate display. As this was not possible at the Museum at that time, it was placed on loan to Drage's Airworld, at Wodonga, Victoria, between 1979 to 1984. In the early 1990s the Autogiro was restored with a grant from the Thyne Reid Education Trust No.1 to its appearance when it came out of service in August 1951.